The Louisiana Department of Transportation and Development (DOTD) is in the process of replacing a major portion of existing LA 1 highway near Leeville, Louisiana, with a lengthy, 18 mile bridge. This area of our state's sensitive wetlands has been featured nationally as being the victim of coastal erosion and ground subsidence, and the existing LA 1 highway is literally sinking. Each year, tropical storms pose more of a threat to LA 1, which now often floods in low-level storms and strands our coastal residents, tourists and the oil industry workers who use our Port Fourchon as a primary access to Gulf operations. 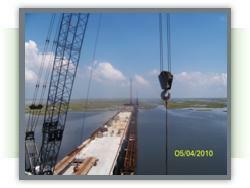 This project will replace our sinking highway by constructing one of the longest bridges in Louisiana and the Americas. When complete the LA 1 Bridge will be almost as long as the nearby Pontchartrain Bridge in New Orleans, generally regarded as the world’s longest bridge. The project will be built in phases as funding permits, with the most critical sections of the project (the southernmost) built first. The first 9 miles of construction are now complete and the portion of the bridge from Leeville to Port Fourchon is open. LA 1 highway and the replacement bridge is, in every way, a lifeline to the Lousiana coast. Our web site is designed to tell the story of this project, from its innovative design and permitting to its progress. Toll rates will not be affected by the new bridge addition. See GeauxPass.com for more information on the LA 1 Bridge tolls, or if you have a concern about a toll payment you have made.